Member of King Snefro Fleet King Snefro 5 is a twin King Snefro 5. This boat was made in Alexandria Egypt in 1999. She is ideal for exploring gorgeous the Red Sea underwater world in small groups. King Snefro 5 can take in only 8 passengers on board. Rooms have all necessary facilities to make your vacations on a board of King Snefro 5 pleasant. Two rooms are equipped with private bathrooms and air conditioning. Other 3 cabins share 2 bathrooms. All are placed on lower deck. Passengers of King Snefro 5 Liveaboard and their fellow travelers can pass the time in between dives in a spacious air-conditioned salon, that has an entertainment area with TV, CD, DVD and central music system. Chef cook would prepare for you tasty food that would be served at the gorgeous dining area. Plus drivers and their fellow travelers can enjoy a stunning marine view from the sun deck, that has numerous of sun loungers. Dive deck on King Snefro 5 Liveaboard is spacious and comfortable, 14 tanks with Nitrox are always on board. Here divers can prepare for the dives. King Snefro 5 safety is ensured. Boat is holding ISO Certification for Recreational Diving Service Providers (EUF: S 000063 till 30.06.16), is a member of Chamber of Diving and Watersports (CDWS: SSSB 0014 S). If you want to get personal care and dive in small group King Snefro 5 Liveaboard is excellent for you. Boats capacity is only 10 divers, so you can be sure that you will get attention from the instructor while you are underwater. For dives with experience and certain certification, King Snefro 5 offers diving on known World War II wrecks of Red Sea, like Thistlegorm and Dunraven. Divers can still see trains, trucks, and motorcycles on a board of Thistlegorm. “Dunraven" sunken ship that lies upside down diagonal to the reef. The wreck is densely covered with stone coral, magnificent soft corals and is now home to a numerous of marine critters. 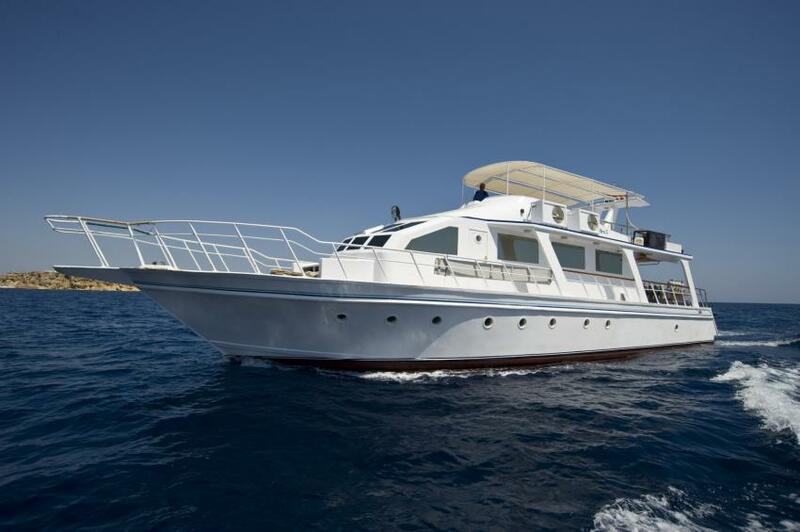 King Snefro 5 Liveaboard itinerary includes diving on dive sites like Strait of Tiran, Ras Mohammеd National Park. The incredible diversity of soft and hard corals, an awesome variety of colorful reef fish and big pelagic species, such as snappers, barracudas, tuna, and sharks will make diving at any location of the Straits of Tiran memorable. In Ras Mohammеd National Park diver can find vertical walls, coral gardens, and plateau. You can dive in the Red Sea all year round. The best time for diving here is from the end of March to the end of November. Average water temperature is about 28C/82F even at 30 m/98 ft deep in summer months.